With all of the specialized cosmetics designed to improve women's complexions, why would anyone exfoliate with a washcloth? There are products available that contain microbeads, crushed fruit and many other exotic combinations, all claiming to beautify the skin. However, using a simple, inexpensive household item can yield great results when it comes to skin care. Perfect for sensitive skin: Anyone with sensitive skin knows that she can't take a chance on just any kind of product. Some of the exfoliants on the market will irritate sensitive and/or acne prone skin. Exfoliating with a washcloth, with or without a cleanser made for this skin type, is a natural and gentle way to slough off dead skin cells that hide a fresh complexion. Inexpensive: Although there are exfoliating products at every price point, you still can't beat the price of an item you already have at home. If you need to purchase new washcloths, leave the fancy, plush brands on the shelf. Choose inexpensive cloths that feel a little rough to the touch. Great for DIY types: Maybe you're not the type to head to a spa for facials and mud baths; you prefer to do your pampering yourself. 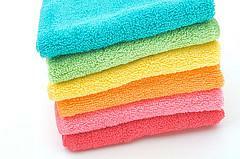 Washcloth exfoliation can give you good results. Plus, for women who love to whip up natural skin care concoctions at home, you can mix up a simple mask to use after you exfoliate as part of your own at-home facial. You control amount of pressure: When you exfoliate at home, you control the amount of pressure you apply to your face, instead of worrying that an esthetician is being too harsh. Once you get to know your skin, you'll know where you need to exfoliate more and which areas require gentle handling. Don't scrub harshly, even in oil-prone areas. Once you know the basics of exfoliating with a washcloth, you may never want to use expensive products again, particularly if being natural appeals to you. Good skin care is sometimes little more than a simple routine, and it doesn't get much simpler than using a washcloth.